I read somewhere that the tool category called “paint sundries” was one of the most probable for impulse buying. Perhaps this is because some to the “tools” in this category are cheap plastic gizmos that will hopefully turn your painting into a easier or more professional experience. Painting is also probably something we all tackle from time to time – regardless of our real trade – so the market for paint sundries is large. This tool would fit into the category well if it were not for the price – which puts it on the more expensive end. Also with many paint sundries the appeal seems to focus on speeding up the prep time or (as in the case of spray equipment) the application process. I find it curious that cleanup time is often overlooked. ^ This is spot on. Maybe they’ll come up with a bigger one so you can put the whole thing in and swirl around with some paint thinner to clean it. There is a gallon version listed Google shopper. Cleanup time and paint wastage (a lot of parts to coat here) would be the main negatives for me on this. Also, what happens when you put it on a full-to-the-brim new can of paint? Paint squeezes out all over I imagine. No thanks! A wonderful solution for a problem we didn’t have. 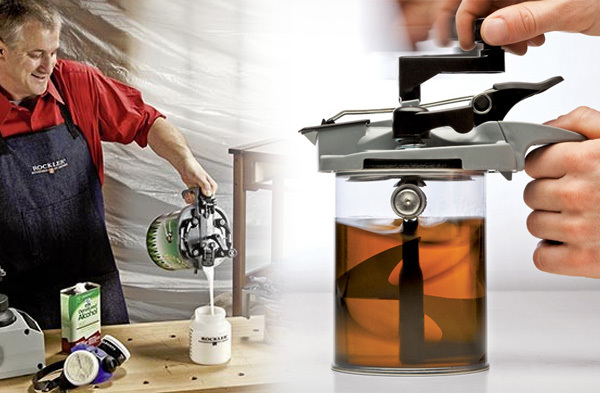 I think the purpose of this thing is you can take and mix up a stain or oil that you really like add the top and use it. Then you don’t pour it back into something you leave the lid on and the stuff doesn’t dry up. I am told it works quite well like this. Think of this more for woodworkers or someone mixing different thinners and paints (auto painting). The Mixing Mate is used to mix but also store. Not sure if I’d use it for paint, but for finish that will be used over several days would be a good application. I think if you mix stain colors or paint colors it would be easier to pour and measure. Other than that they look like they’d mix up a great glass of your favorite adult beverage, and give you the ability to pour it in a glass with no waste. I don’t think this was designed for use with latex paint or any other type that you brush on. Prepping paint/finish for spraying is another story, however, and this would be quite useful. Also for paints that have speckle components added just prior to application, such as garage floor finishes, the MM might be great. I think it would work great for mixing custom stain colors to ensure proper dye & pigment binding for even color & then pour it into your spray gun, versus from a can. (alot less mess). I’e always like the ones you can chuck into a drill and then go nuts with. I agree,I got a couple of those, very useful, easy to clean, and very cheap, they can be had for 3 bucks at walmart. Need one of these for mixing separated peanut butter!